As mentioned earlier, the 4 day Inca Trail is probably the most famous walking route to Machu Picchu and one of the most famous multiday hikes in the world. Being so popular, it is obvious that the number of people have their impact on this ancient route. 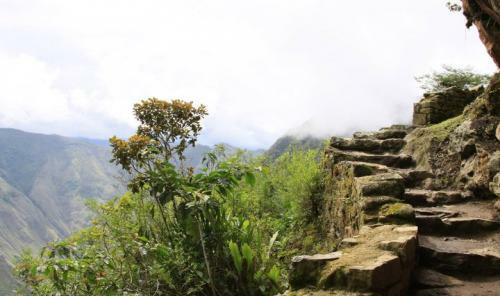 Many parts of the Inca Trail actually lead over ancient paths constructed by the Inca with carved stones, through tunnels carved out of the rocks, Inca ruins and forests that are part of the Machu Picchu National Park. Machu Picchu national Park is known for its unbelievable number of Hummingbirds and Orchids. Taking all this into account it is clear that if this would not be protected from the tourist pressure in a couple of years there would be very little left of this amazing route. Therefore in order to have some control over the impact, the INC (the Peruvian National Cultural Institute) decided in 1999 to implement a maximum number of 500 people daily on the Inca Trail. Furthermore they forbid the use of mules and iron walking poles for the Inca Trail as these can damage the original paths as they were constructed by the Inca. The maximum amount of people has been set on 500 and is very strictly checked. The number is the total number for all visitors, guides, and porters on one day on the Inca Trail and can under no circumstance be higher. As there is also a 2 day Inca Trail, the visitors for this short version are also included in this number. In KM 82 or 88, where the 4 day Inca Trail starts and on KM104 where the 2 day Inca Trail starts there are check points checking the reservation for each hiker and the passport details. This means that all reservations for the Inca Trail have to be done on name and passport number. If you would book the Inca Trail with an agency and they do not have your passport number they will not be able to reserve tickets for you. With this in mind it is obvious that when doing the Inca Trail you will need to bring your passport, the original as in many occasions they do not accept a copy. With regards to where, when and how to book the Inca Trail; it is more than advisable to book your Inca Trail several months in advance. In case you would like to do the Inca Trail in the high season (June through September) keep in mind that the trail often sells out almost 6 months in advance for these months. For the low season the rush will be less but the Inca Trail selling out 1 or 2 months in advance in the low season is definitely no exception. Prices for the Inca Trail start around US$500 and can go all the way to almost US$1,000 per person. Off course these are just indications but it is important not to be too cheap when doing the Inca Trail. The hike is expensive as most material will have to be carried by porters. Therefore as a rule of thumb it is never advisable to take the cheaper companies as they will try to skim of their prices on the backs of their porters and guides. Also make sure that you know what meals and materials (tents, sleeping bags, mattresses, etc...) have been included in the price. Another item to check is if the actual entrance to Machu Picchu has been included and the return train tickets back to Cusco.